Giant, solid wood block tower stands at a 1.5 feet tall when assembled and can stack up to more than 4 feet tall. Enjoy 18 levels of block-stacking, tower-crashing fun! Includes 54 high-quality, smoothly-finished hardwood blocks designed for competitive play; no unfinished or cheap, splintered wood blocks here! 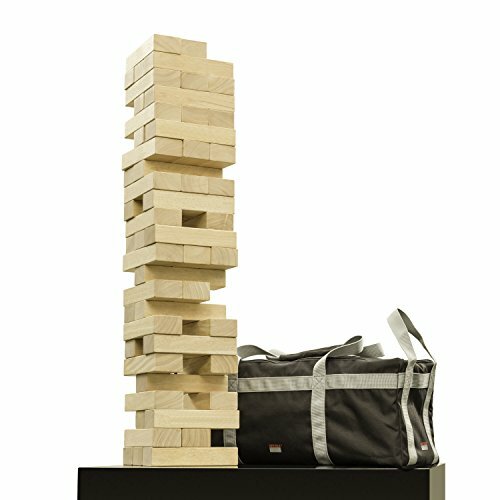 Thick, black canvas carrying bag lets you take the set with you. Double-zipper design allows a panel of the bag to lift up for easy access and thick durable handles make transporting the tower easy. Stack blocks as high as they can go and watch the tension build. But be careful! The bigger the build, the harder the fall! Ideal for outdoor family outings, camping trips, weddings, bars, birthdays, and everyday backyard fun!